PROVIDENCE, R.I. [Brown University] — A new instrument could someday build replacement human organs the way electronics are assembled today: with precise picking and placing of parts. In this case, the parts are not resistors and capacitors, but 3-D microtissues containing thousands to millions of living cells that need a constant stream of fluid to bring them nutrients and to remove waste. The new device is called “BioP3” for pick, place, and perfuse. A team of researchers led by Jeffrey Morgan, a Brown University bioengineer, and Dr. Andrew Blakely, a surgery fellow at Rhode Island Hospital and the Warren Alpert Medical School, introduces BioP3 in a new paper in the journal Tissue Engineering Part C.
Because it allows assembly of larger structures from small living microtissue components, Morgan said, future versions of BioP3 may finally make possible the manufacture of whole organs such as livers, pancreases, or kidneys. Honeycombs of bioengineered tissue, top, can be stacked and arranged to build larger living structures. Morgan’s research has long focused on making individual microtissues in various shapes such as spheres, long rods, donut rings and honeycomb slabs. 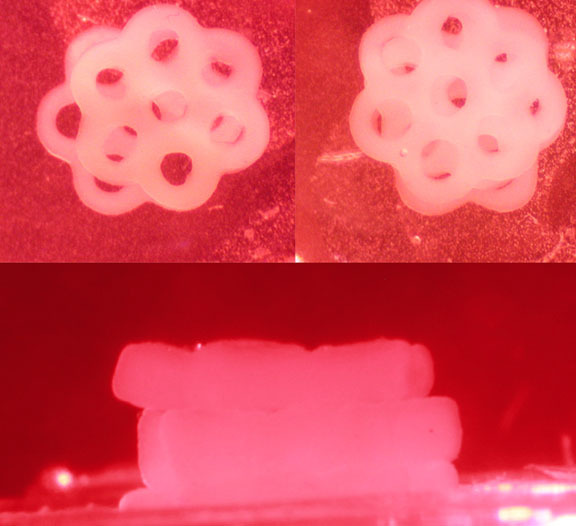 He uses a novel micromolding technique to direct the cells to self-assemble and form these complex shapes. He is a founder of the Providence startup company MicroTissues Inc., which sells such culture-making technology. Now, the new paper shows, there is a device to build even bigger tissues by combining those living components. “This project was particularly interesting to me since it is a novel approach to large-scale tissue engineering that hasn’t been previously described,” Blakely said. The BioP3, made mostly from parts available at Home Depot for less than $200, seems at first glance to be a small, clear plastic box with two chambers: one side for storing the living building parts and one side where a larger structure can be built with them. It’s what rests just above the box that really matters: a nozzle connected to some tubes and a microscope-like stage that allows an operator using knobs to precisely move it up, down, left, right, out and in. The plumbing in those tubes allows a peristaltic pump to create fluid suction through the nozzle’s finely perforated membrane. That suction allows the nozzle to pick up, carry and release the living microtissues without doing any damage to them, as shown in the paper. Once a living component has been picked, the operator can then move the head from the picking side to the placing side to deposit it precisely. In the paper, the team shows several different structures Blakely made including a stack of 16 donut rings and a stack of four honeycombs. Because these are living components, the stacked microtissues naturally fuse with each other to form a cohesive whole after a short time. Because each honeycomb slab had about 250,000 cells, the stack of four achieved a proof-of-concept, million-cell structure more than 2 millimeters thick. That’s not nearly enough cells to make an organ such as a liver (an adult’s has about 100 billion cells), Morgan said, but the stack did have a density of cells consistent with that of human organs. In 2011, Morgan’s lab reported that it could make honeycomb slabs 2 centimeters wide, with 6 million cells each. Complex stacks with many more cells are certainly attainable, Morgan said. If properly nurtured, stacks of these larger structures could hypothetically continue to grow, Morgan said. That’s why the BioP3 keeps a steady flow of nutrient fluid through the holes of the honeycomb slabs to perfuse nutrients and remove waste. So far, the researchers have shown that stacks survive for days. In the paper the team made structures with a variety of cell types including H35 liver cells, KGN ovarian cells, and even MCF-7 breast cancer cells (building large tumors could have applications for testing of chemotherapeutic drugs or radiation treatments). Different cell types can also be combined in the microtissue building parts. In 2010, for example, Morgan collaborated on the creation of an artificial human ovary unifying three cell types into a single tissue. Because version 1.0 of the BioP3 is manually operated, it took Blakely about 60 minutes to stack the 16 donut rings around a thin post, but he and Morgan have no intention of keeping it that way. In September, Morgan received a $1.4-million, three-year grant from the National Science Foundation in part to make major improvements, including automating the movement of the nozzle to speed up production. “Since we now have the NSF grant, the Bio-P3 will be able to be automated and updated into a complete, independent system to precisely assemble large-scale, high-density tissues,” Blakely said. In addition, the grant will fund more research into living building parts — how large they can be made and how they will behave in the device over longer periods of time. Those studies include how their shape will evolve and how they function as a stack. Brown has sought a patent on the BioP3. In addition to Blakely and Morgan, the paper’s other authors are biology graduate student Kali Manning and Anubhav Tripathi, profesor of engineering, who co-directs Brown’s Center for Biomedical Engineering with Morgan. 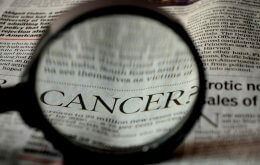 The National Institutes of Health (grant T32 GM065085-09) and the NSF (grant CBET-1428092) have supported the research.